While fall is just around the corner, who says that you have to leave summer behind so soon? I have good news, you don’t! As much as I love investing in chunky knit sweaters in deep red, burgundy and orange hues, when it comes to accessories, I want something that’s going to pop. As it just so happens, nothing turns heads quicker than a functional satchel bag in a punchy shade of pink, green or neon yellow (just to name a few must-have colors!). Satchels are conventional and can easily be worked into your daily look. Whether you’re the type of girl who always carries a chic handbag to class or you simply want a stylish bag for the weekend, you’ve come to the right place. Here are three outfits to prove that the possibilities are endless! If you live for the color pink, then this pink satchel has your name on it! Whether you want to hear it or not, school’s back in session! While cutoff denim shorts and an effortless crop top may be your go-to wardrobe staples during the summer season, they may not exactly be classroom-appropriate (this really depends on how dressed up you prefer to be for class though!). 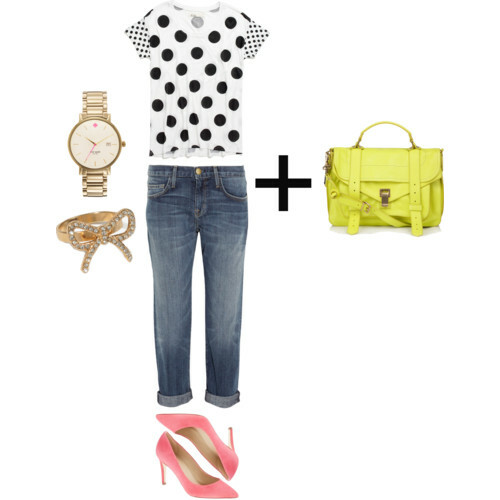 This outfit is a great example of not only what to wear around campus, but also how to style your pretty pink satchel. When working any colorful bag into your outfits, remember, less is more. 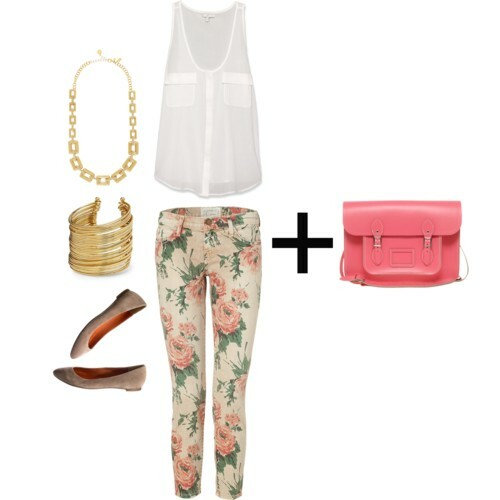 Thanks to the hints of pink that appear in these floral printed jeans, this pink satchel is the perfect match. Keep the rest of your outfit toned down with a simple sheer blouse, neutral-colored flats and some gold jewelry to add some bling! A red satchel combined with a pair of loafers or oxfords is the definition of schoolboy-chic. 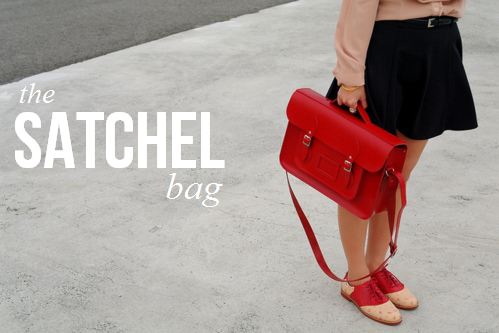 In the world of satchel bags, red might as well be the new black. If you’re looking for a colorful bag, but want something subtle enough to wear with a number of ensembles, then red is the way to go! Guaranteed to look just as lovely with a navy blue dress as a simple pair of jeans, a red satchel will instantly jazz up any combination. To achieve the low-key and effortless outfit above, begin with an ultra-feminine lace top and fitted striped skirt. Next, tie your look together with these charming two-toned oxfords (the perfect complement to a fire-red Rebecca Minkoff satchel!). Complete this “A+” look with a timeless gold pendant necklace for an ultimate fall-ready ensemble. Relaxed-fit boyfriend jeans. – check. Sassy pink heels – check. Neon-yellow satchel – CHECK! Since you’re always ahead of the game when it comes to test-driving the latest fashion trends, it’ll only be a matter of time before you have one of these: a neon satchel. If you’re not a fan of bold accessories or are one to shy away from color, then a bright-colored bag is exactly what the doctor ordered. Transforming any run-of-the-mill ensemble into something fresh and exciting, a neon satchel will help you get out of that wardrobe rut in no time! 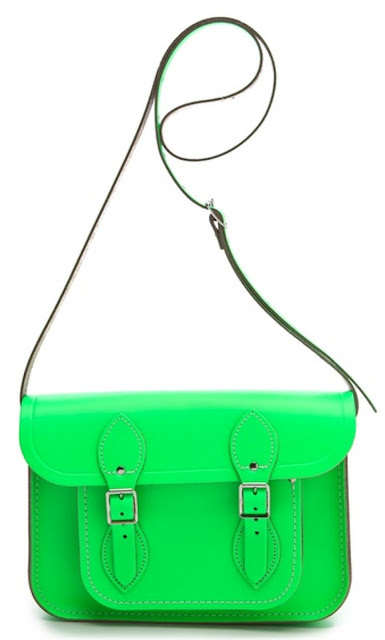 While this gorgeous Proenza Schouler satchel may not be within your college-budget, that’s okay! Notice how amazing it looks when paired with an adorable polka dot t-shirt, cuffed jeans and some signature gold hardware. The next time you want to take up your outfit up a notch, simply try adding one eye-catching accessory – the end result will be so worth it! What color satchel is hot right now, you ask? 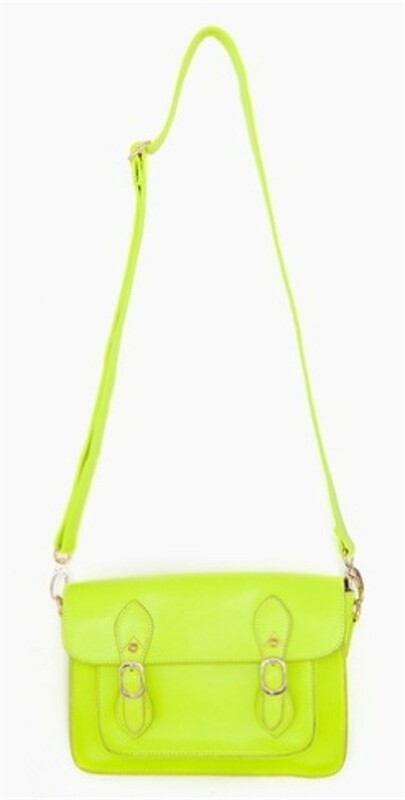 From scouring endless fashion blogs, I think it’s safe to say that neon yellow is having a major moment. Whether you pair a neon yellow satchel with a navy blue polka dot printed pants and a white peplum top or keep it sophisticated with a white blazer and LBD, the bag makes all the difference! At $48, this satchel from Nasty Gal is too good to be true! Does cobalt blue ever go out of style? (I think not!) 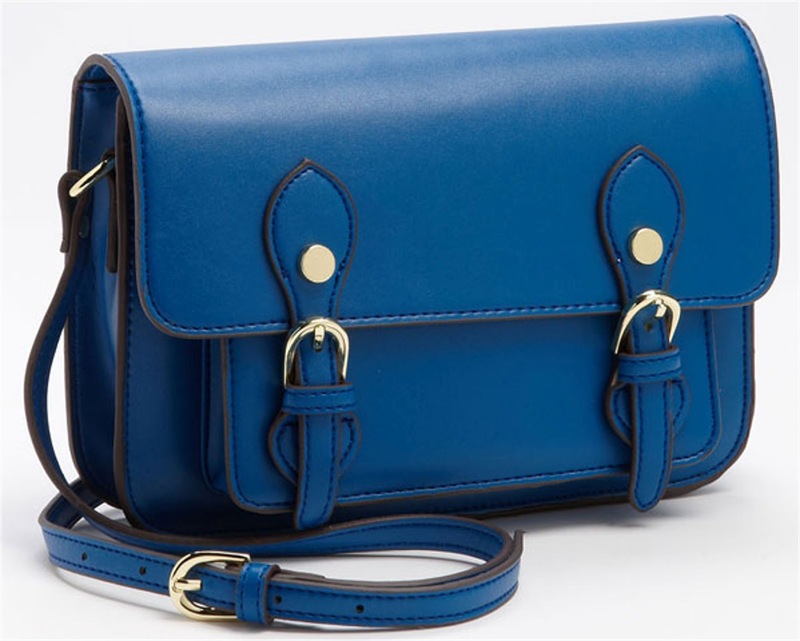 This cross-body satchel bag from the Steven by Steve Madden collection is uber practical and will keep your hands free when you’re rushing off to class. It will definitely put a bold splash of color to your favorite jeans or gray cable knit sweater ... let’s face it, you need this bag! For those of you who want the best of the best, then I highly recommend this lovely green satchel by the Cambridge Satchel Company. It is described as the “classic satchel with a contemporary twist,” and it is sure to become an instant favorite in your handbag rotation. Match it with a floral dress or your standby jeans and T-shirt for an immediate dose of whimsy! Break out of your end-of-summer doldrums, and say hello to a new satchel purse. They are so fun and versatile – you simply must invest in one this fall season! absolutely love these bags! they are so casual yet chic!!! !